In period known as alumen faecis, alom de fece, lume di fecca, and lume de fezza, alum feces is an often-mentioned medieval chemical ingredient which, surprisingly, has nothing to do with alum. Naturally occurring winestone from white wine, untreated. All photos by THL Elska. Alum of lees (alumen faecis) is potassium carbonate and made by burning the sediments of wine, called lees. During the fermentation of grape juice harmless crystalline deposits separate in wine as crude tartar and are deposited in wine casks. These deposits consist mostly of tartar, the potassium salt of tartaric acid, with small amounts of cream of tartar and of pulp debris, dead yeast, and tannins; impurities which contaminate the potassium tartrate. Tartrates separate from new wines because they are less soluble in alcohol than in non-alcoholic grape juice. Approximately half of the tartrate soluble in grape juice is insoluble in wine, and in white wines the sediment can look alarmingly like shards of glass. Crude tartar was well known during our time of study and is used as an ingredient in many books of secrets dealing with medicinal recipes, fabric cleaning, dyeing, etc. My impression is that the craftspeople worked things out very well by trial and error, but did not know why certain combinations worked. This could show in the inclusion of superfluous items, ingredients with no apparent use. For instance, juice of celandine has no cleaning properties as far as modern chemistry is aware. The addition of specific combinations of ingredients (chemicals) would react with each other (chemistry) to create a new ingredient, which would significantly boost the workings of the recipe but without the craftsman knowing why it worked more effectively. For instance, the combination of alum feces (potassium carbonate) with crude tartar (dipotassium tartrate) would chemically react and precipitate cream of tartar (potassium bitartrate), a more effective stain cleaner than tartar itself. While it is not difficult to crystallize cream of tartar out of crude tartar and use as a straight ingredient, the question is: were the medieval craftsmen aware of this chemical and did they find it easier to produced it in situ, or did they use the round-about way as they did not know, aside from, this works? From working with soap recipes, I had come across the mentions of tartar, alum feces, and alum catini multiple times, and as part of my soap research I wanted to learn how to make these from scratch. While it took me about two years to find a reference to alum feces (at a Pennsic workshop on laundry; I later tracked down the bibliography) that identified it as the burnt lees of wine, I only recently found the final piece of the puzzle. Alum feces and alum catini are often mentioned in the same context in similar or the same recipes. I assumed them to be of a similar background and when I found that alum feces was burnt tartar I made a leap and assumed alum catini to be the ashes of burnt cream of tartar. It made sense at the time! With my background in soap making I could have anticipated this, but it never even occurred to me. What I did wonder about is why I did not find any mention to soda ash in any of my medieval soap recipes… Now, not only did I solve one small mystery of identification, I actually ended up solving a much larger one on technique. The word “tartar” comes to English via Medieval Latin from the Medieval Greek tartaron. 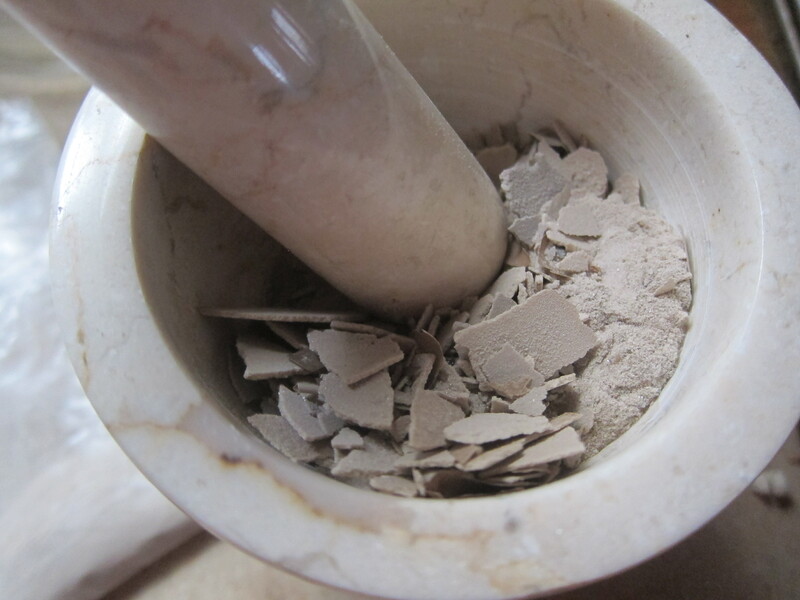 This crude form of tartar, also known as winestone, argol, and beeswing, is collected and purified to produce the white, odorless acidic powder known as cream of tartar, or potassium bitartrate. As a food additive, tartar shares the E number E336 with cream of tartar, which does not help the confusion between dipotassium tartrate (tartar) and potassium bitartrate (cream of tartar). Alum feces or potassium carbonate can be made by igniting and ashing tartrates (natural winestone or commercial cream of tartar) to produce pearl ash. This salt (alkali) of tartar was deemed stronger than almost any that is obtained from other matters. Potash could also be purified by baking it in a kiln or oven until all the carbon impurities are burned off, which would also resulting in pearl ash (sometimes called fly ash, as it easily blows away). The same technique works to make alum catini by ashing calcined marine plants in a kiln … or you could buy a box of washing soda, which is also pure sodium carbonate. The production of potash and pearl ash from wood were of such importance to Britain that these commodities could not be exported by the American Colonies to ports outside of the British Realm. High-quality potassium carbonate was used in glass making, soap making, fiber cleaning, and dyeing and as a medicinal ingredient. Tartrates were used in fiber cleaning & dyeing and as a medicinal ingredient. Refined crude tartar becomes tartar or argol (dipotassium tartrate). Refined tartar becomes cream of tartar (potassium bitartrate). Tartrates are buffering agents. Tartar (sometimes in the form of wine lees), was a common ingredient in both lye-based and non-lye-based cleaning solutions. Tartar’s acidic qualities somewhat neutralize the harshness of an alkaline solution, which greatly helps protein-based fabrics like woolen cloth. Tartrates are acidic, and act as sequestrants. As well as providing buffering action, the acidity of tartar and cream of tartar makes these substances useful in removing inorganic stains. They have some ability to act as sequestrants, by interrupting the oxidation of metals, making it possible to dissolve and removing metal and iron oxidation. It is taken from the Latin word “sequestrare” meaning to remove from use. Cream of tartar is an effective and still in use household remedy against iron stains and fruit stains on linen. Carbonates are alkalis. In solution with water carbonates (CO3) react to produce hydroxides (OH); for instance potassium carbonate (K2CO3) plus water (H2O) produces potassium hydroxide (KOH), which is alkaline. Alkaline solutions are common cleaning agent of the 15th and 16th centuries. Alkalis are best at removing stains of a fatty nature and some proteins. When applied to grease and oil stains, the saponification that occurs is an additional aid to stain removal. Alkaline solutions were also made from boiling potash (including hearth ashes), a common source of potassium carbonates, but depending on the quality of the source is often significantly less pure (due to incomplete burn) than burnt tartar, or alum feces. “… as well as its property of not being soluble in water without much difficulty: for a very great quantity of water is requisite to keep the crystals of tartar in solution; and it must moreover be boiling hot; otherwise as soon as it cools most of the tartar dissolved in it separates from the liquor, and falls to the bottom in the form of a white powder” From the Encyclopedia Britannica, 1771. From the information given in the above text, among others, I choose to boil the winestone and let it cool down to re-crystallize the tartar out of the suspension. 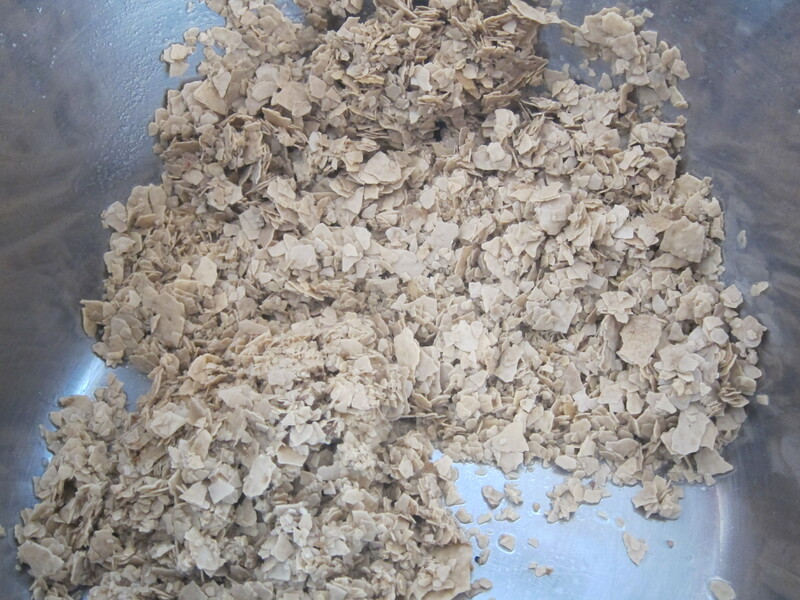 Rinse and dry crude tartar. My tartar came from a local wine maker (Barry Family Cellars) and comes from white wine (which is why it is uncolored). It smells weird. 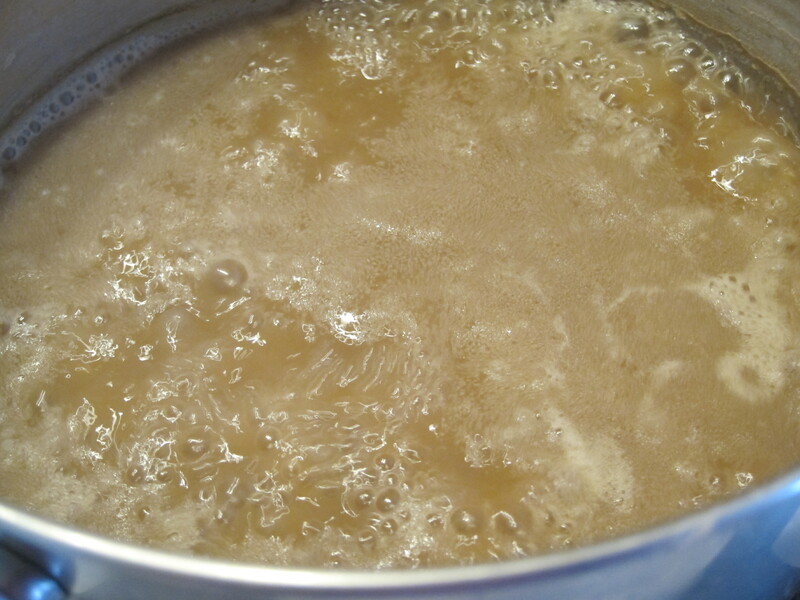 The crude tartar is added to water. 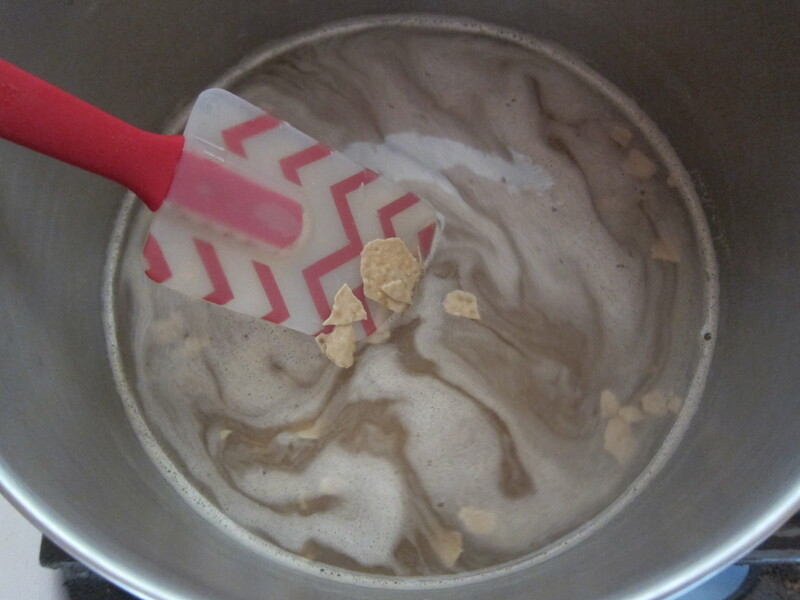 It only dissolves during the boiling stage of water and settles back out of solution when the water cools down. The refined tartar settles out of solution in a fine powder and as a sludge can easily be dried. When using red wine winestone, this stage would be done multiple times while decanting the water which would contain most of the colorants and tannins. This did not happen. I did not filter the hot liquid but let it cool down on its own, as indicated by the more recent texts. I wonder if the little crystals indicated are cream of tartar instead of straight tartar, as cream of tartar will keep appearing at each new boil until the liquid is exhausted. 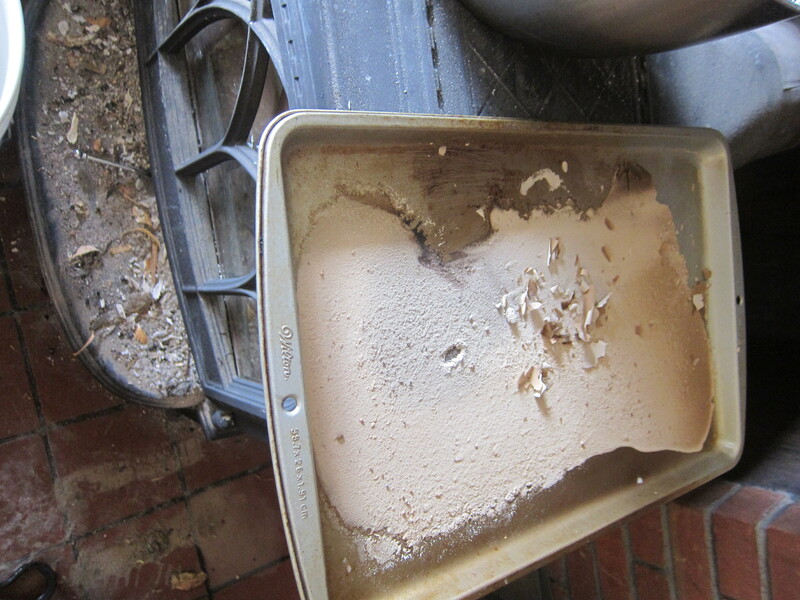 The dried sludge is broken off and powdered in a fine mortar and sieved. The resulting white powder is tartar, or potassium tartrate. 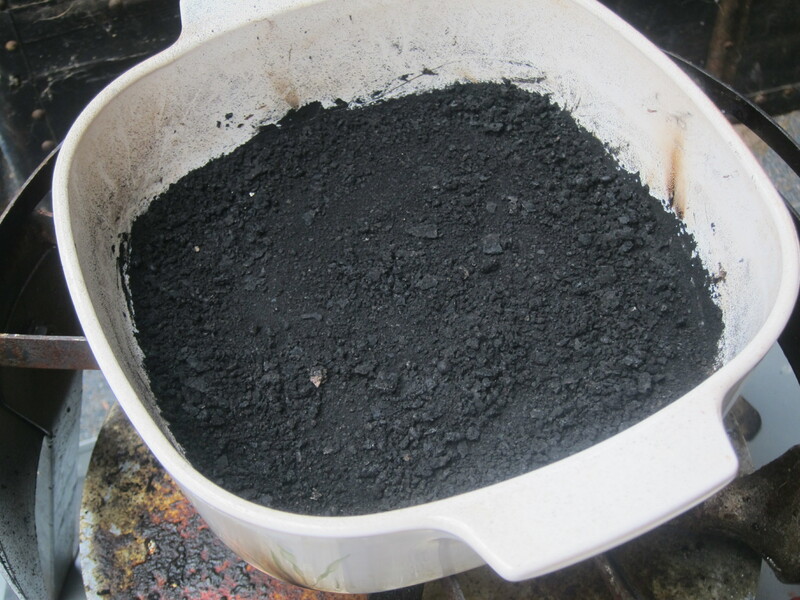 The crude tartar is calcined over open fire (propane burner) in a fireproof vessel in a well-ventilated area (sunroom) into charcoal. Iron was indicated to be able to withstand the heat, but because I enjoy my cast iron I choose to use a pyroceramic corningware dish (Pyrex would shatter). Calcining creates lots of smoke while the organic contaminants and volatile gasses are burned off. Then the black charcoaled winestone is put on an iron dish (pizza plate) into the oven and ashed using the self-cleaning cycle. This worked really well (and I was very glad I did the calcining outdoors as we do not have an outdoor vent on our oven). 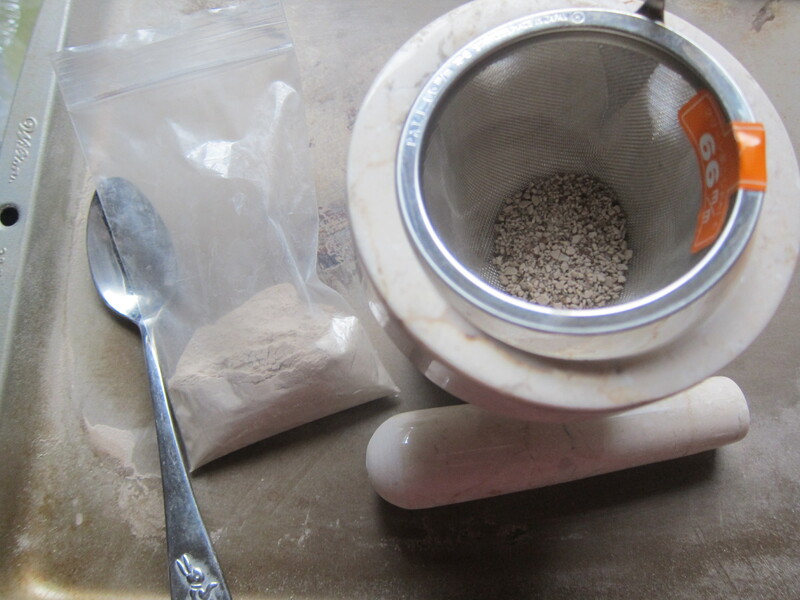 The powder is then filtered and stored in a jar. As mentioned in the 1686 A course of chemistry, if these ashes are dissolved or lixiviated in water, and then evaporated, another salt will appear, which will have become hygroscopic, or draw moisture from the air: “Break the Retort which served you for distillation of Tartar, and take the black mass you find in it; Calcine it until it becomes white, then put it into a great deal of hot water, and make a Lixivium, filtrate it, and pour it into a glass, or earthen vessel, evaporate in a sand-heat all the water, and there will remain a white salt, which is called the Alkali Salt of Tartar. 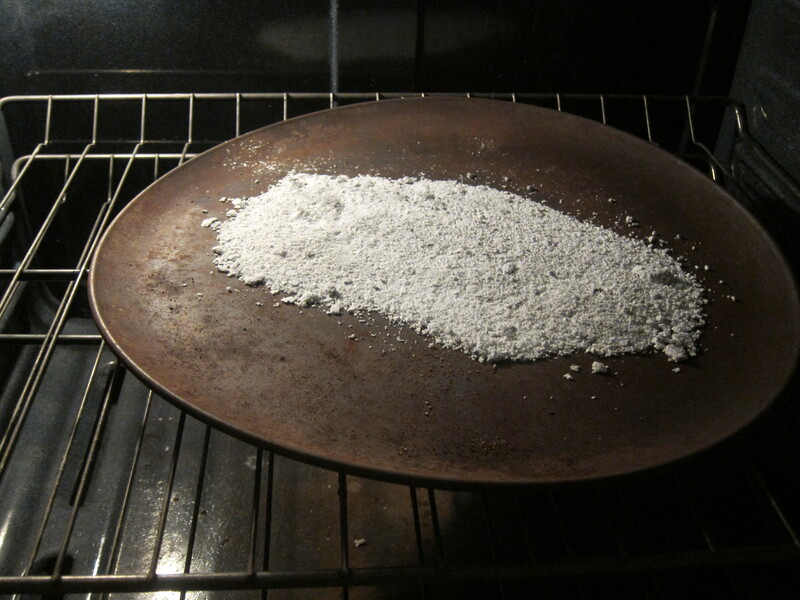 If you expose for some days in a Cellar this Salt of Tartar in a wide glass vessel, it will dissolve into a liquor that is improperly called Oil of Tartar per Deliquium.” What this indicates is that the ashes of tartar, or the potassium carbonate, dissolved in water reacted to form potassium hydroxide, which when evaporated will re-crystallize, but will also be hygroscopic (pull moisture from the air, as soap makers know from experience hydroxide is wont to do!). Following are two period recipes which include tartar and alum feces. For more samples, please see my Ice Dragon documentation. From T bouck va wonder (The Book of Wonders), anonymous, 1513: this recipe would make an all-purpose cleaning soap ball. The rock alum would act as a mild deodorant and acidic buffer, the tartar would help buffer the alkaline soap and help remove mineral stains, the egg would help disperse trapped dirt (and help with sticking the dry powders to the hard Spanish soap). I am not familiar with waterlily rhizomes in specific, but know of similar plants which are saponaria (soap plants) and would act as a wetting agent to help the soap penetrate the fabric deeper so more debris can be rinsed away. 32. To make soap, that, purifies all sorts of stains, whatever they might be. Take rock alum, lees [tartar] one pound and make this in a powder, rhizomes of flames or waterlilies of Florence, pulverized a half pound, a fresh egg, two pounds and a half of spanish soap, stomp the previously mentioned powders with the egg and the soap, and make little balles thereof. And if you think the egg was not enough, take as many as you like, or as you think is enough, to make the previously mentioned. And if you want to take on the stain, take clean water, and soak and wash the mentioned stain of both sides of the sheet, and rub with the mentioned ball, and sheet on sheet; that done, wash the dirtiness out with fresh water, and wring the sheet to get rid of the fat, and wash the sheet again with fresh water, and it will stay clean. From Allerley Mackel (All Kinds of Spots) by Peter Jordanim, 1532: This recipe describes not only the use of tartar in a cleaning solution, but also a method by which cream of tartar was obtained for use in cleaning. 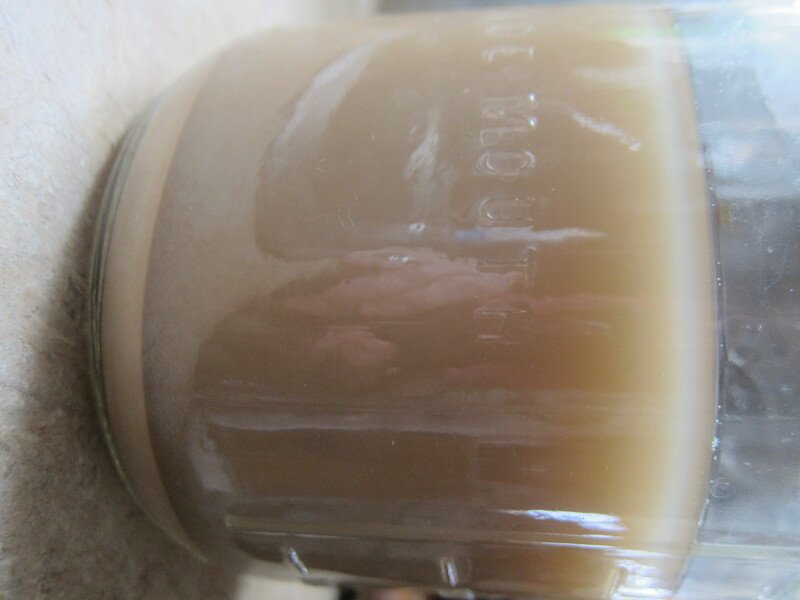 When alum feces (potash or pearlash; potassium carbonate) is combined with crude tartar (tartaric acid) in a liquid solution, cream of tartar (potassium bitartrate) is precipitated. 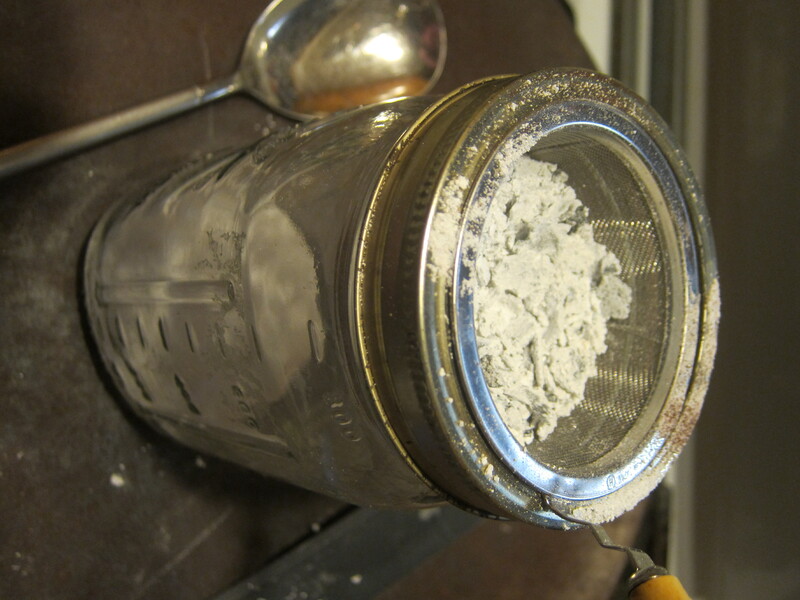 Some precipitation occurs naturally during the winemaking process, but collecting the tartar-rich solid leftovers during winemaking and adding them to a solution of potassium hydroxide (lye, or potassium carbonate mixed with water) allows for a much greater amount of pure cream of tartar to be created. (Leed) And once again just about all available cleaning materials are then mixed together. This combinations should form a concentrated emulsion containing solvents to hold fats and waxes in solution (the campfor and oxgall), tartrates to help remove mineral stains, and absorbents to help remove embedded dirt (the alum with the dragon’s blood would form an aluminum resinate which would give some viscosity to the mix). Six ounces alum feces, four ounces crude tartar, two ounces alum, one half quent [1/4 scruple or a dragme] camphor, one half quent dragon’s blood, grind all together to a fine powder and mix well, then take six ounces ox gall and six “bucklin” of clear water, put all together in a kettle, let boil to remove a third of the volume, then strain through a piece of cloth. Whenever you cannot get the ox gall or the camphor the water itself is strong enough. For use take a new piece of woolen cloth, moisten it with the water, and rub the spot or stain with it. When the piece of cloth becomes dry, moisten it again with the water and rub until the spot has disappeared; thereupon take warm water and wash the place where the stain has been. But for white cloth take the same water and add some soap, distill it, and work as before. For a complete bibliography, more background, more photos, and how to make cream of tarter, you can download my documentation here. (1771) Encyclopedia Brittanica. Vol. II. Edinburgh: Colin Macfarquhar, Society of Gentlemen in Scotland. Ellis, Marietta (2015?) Colonial Soapmaking – Its History and Techniques. Spadét. Leed, Drea (2006) “Ye Shall Have It Clean”. Medieval Clothing and Textiles, Vol 2, the Boydell Press, NY.